All codes of atoall web tool. Place this code similar as well as FaceBook, Twitter etc. URLs of websites are in English. So, Hindi and regional language people feels hesitation to surf these pages. 1. Problem: If a Hindi language user gets Hindi webpage by help of anyone then he needs help again and again of anyone. 2. 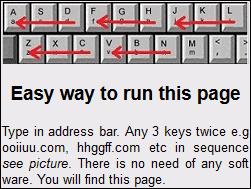 Solution: After this new method he will press only any 3 keys twice from keyboard in add bar and Ctrl+Enter and he will get his webpage. Ex. ppooii Ctrl+Enter, kkjjhh.com etc. 1. Alphabets of websites are in English. 50% of the world's population is regional language, they can't visit. 2. Spelling mistake is a big issue. 3. We can not remember all domains. 4. Alphabets of many domains are not in sequence on keyboard. 5. There are lots of confusions. English keyboards, regional language people, English urls, regional language urls. 1. shortcut web tool is in sequence. 2. There is no need to remember alphabets. Web tool is working from full keyboard. 3. Spelling mistake is no issue in web tool. 4. There is no need of English knowledge. User can press any buttons in sequence. 5. It is common method for all users. 1. Copy and paste code in Example.com. Paste code in body tag. Upload it. 2. Open Example.com in your browser for one time after pasting the code. 3. You will see Example.com with web tool. 4. 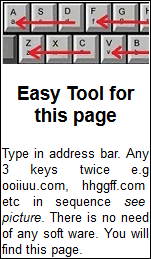 Type web tool in address bar e.g. ppooii.com or (ppooii and Ctrl + Enter), hhggff.com etc. See keyboard picture. 5. Now you will see your Example.com by shortcut web tool !!!!!. 6. shortcut web tool fixes only that pages which pages have this code, so paste this code in maximum pages of Example.com. Sample 1 (260x200) with method. Sample 9 (155x264) for Example.com. Sample 10 (18x18) for Example.com. Sample 11 (20x20) for Example.com. Sample 12 (24x24) for Example.com.